Karlstejn - the most significant medieval castle, built in 1348-1355 under the rule of Charles IV for the purpose of safekeeping the crown jewels and state documents. In the 16th century, it was reconstructed in the renaissance style and altered in pseudo-Gothic style in the late 19th century. In Holy Rood chapel we can find a unique collection of 132 Gothic tabular paintings by Master Theodorik from 1360. The castle is situated 40km south-west of Prague. Konopiste – The Konopiště chateau was founded as a gothic fortress after model of french castles in the end of the 13th century, probably by the Prague´s bishop Tobiáš of Benešov. The first intervention to the medieval structure was made in the end of the 15th century by Jiří of Šternberk than in the beginning of the 17th century by the Hodějovští of Hodějovice. The Vrtbovští of Vrtba changed Konopiště to a baroque residence in the 18th century. Kutna Hora - the old historical town of Kutna Hora was founded in the second half of the 13th century on an earlier mining settlement. In the Middle Ages the town was renowned for its silver mines whose wealth backed the power of Czech kings. Apart from wealth, silver mining brought to the town the status of the country’s second most important town after Prague. There is many sights as the mint Vlassky dvur which produced silver “Prague groschen”, St. Barbora’s Church, the church of St. James and etc. 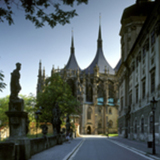 In 1961 the historical center of Kutna hora was declared a national reservation and in 1995 it was included into the UNESCO cultural heritage list. 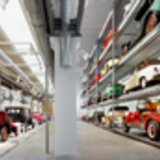 Mlada Boleslav – The Skoda Auto museum was opened in 1995 – the centennial anniversary of the Laurin & Klement faktory. It was created as a venue for dialogue between industrial and social culture. You will see the history of automobile manufacture in Mladá Boleslav from the very beginnings in 1895 to the latest models of today. More recently, the company presented its latest models of Felicia, Octavia, Fabia, and, finally, the company’s flagship, model Superb. Ceske Budejovice is the centre of South Bohemia, a very attractive tourist region characterized by numerous fishponds, rich in artistic and historical monuments. The town, founded in 1265, is famous for Budweiser beer, which is produced by the Budvar Brewery, established in 1894. In 1832, the first railway in Europe began operations between Ceske Budejovice and Linz in Austria. Some of the old railway stations are still preserved. The main square with arcades is the biggest square in the Czech Republic. It is lined with Gothic, Renaissance and Baroque houses. A tower, designed in Gothic and Renaissance styles, dominates the town. The typical ale-house Masne kramy is also worth visiting. The town also offers an annual music festival, as well as agricultural exhibitions. Hluboka nad Vltavou is a town north of Ceske Budejovice with a chateau that belongs to the most picturesque and most visited Czech landmarks. It is located on the site of a former royal castle reconstructed on several occasions, and overlooks the river Vltava. Between 1841 and 1871, it was remodeled in the neo-Gothic style, inspired by Windsor Castle. Its 140 rooms house rich collections of Flemish tapestries dating back to the 17th century, as well as weapons, portraits, period furniture, glass and china. The former riding school has been adapted as the Alsova South Bohemian Gallery, containing valuable collections of Gothic and modern art. The chateau is surrounded by a romantic park with many rare trees. Cesky Krumlov is one of the most magnificent historic towns in the country. The centre of Cesky Krumlov has preserved its authentic medieval character and has been given the status of an urban reserve protected by UNESCO. The dominant feature is the castle, founded in the 13th century, and later rebuilt in Renaissance and Baroque styles. It is a vast compound of buildings, including the 18th-century summer pavilion Bellaria and a riding school. The rooms are beautifully furnished and contain some valuable paintings. Later, an open-air theatre with a unique revolving auditorium was added. Surrounding the castle, the town is beautifully situated on a headland formed by meanders of the river Vltava (the Moldau). The great majority of the town houses are fine examples of Gothic architecture, later rebuilt in Renaissance and Baroque styles. The town has an unbelievable 250 protected structures, including the Renaissance Town Hall, a convent, a monastery and several churches. A walk through the picturesque streets and squares is an experience to be treasured. Near to Cesky Krumlov is located small village Holasovice, which is typical example of traditional Central European village. A unique collection of original rustic smallholdings has been preserved around a middle of a large rectangular village green. Trebon is another jewel of a town of South Bohemia. Trebon was settled in the 13th century by the Wittkowitzes (later called Rosenbergs), once Bohemia's noblest family. Thanks to them, this unlikely landlocked town has become the centre of the Czech Republic's fishing industry. In the 15th and 16th centuries, the Rosenbergs peppered the countryside with 6,000 enormous ponds, partly to drain the land and partly to breed fish (mostly carp). Pond Svet is the closest one to the town. The graffito Renaissance exterior of the castle is highly impressive. The intact town walls, built in the 16th century, are some of the best in the Czech Republic. An 18th-century brewery, still producing outstanding beer, remembers that beer has been brewed since 1379 here. The main square is famous with its collection of well-preserved Renaissance and Baroque houses. Next to the square is the Trebon Castle and nearby the Augustine monastery the famous Altar of the Masters of Wittingau, dating from the late-14th century. Jindrichuv Hradec was in the Middle Ages one of Bohemia s most important towns. Its old town and castle, situated between the Nezarka river and Vajgar Lake, with the Renaissance castle with rich interior collections on the lakeside, are attractive and unique. The town, prospering from its position on a trade route from Austria, and from nearby silver mines, suffered three great fires in 1435, 1773 and 1801, the result was broad spectrum of architecture from the 15th to the 19th centuries. Sumava, or the Sumava Mountains, is the largest mountain range in the Czech Republic and the largest woodland area in Central Europe. 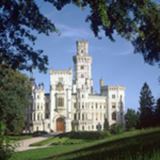 It is situated in Southwest Bohemia, along the border with Germany and Austria. It is very popular due to its beautiful natural scenery and cultural landmarks. The Sumava National Park is connected with the Bavarian National Park in Germany. It forms an enclave in Central Europe which has been hardly touched by man. The longest Czech river, the Vltava (the Moldau), has its source here. 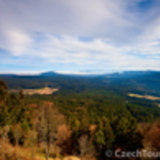 The highest peak of the Sumava Mountains on Czech territory is Plechy (1,378 m), situated near the border, not far from the Lipno Lake. The Boubin mountain (1,362) is famous for its primeval forest. There are five lakes in the area. They were all created by glacial activity. The largest among them is the 18-hectare Cerne jezero (Black Lake) which is 39 meters deep. The mountains offer excellent conditions for cross-country and downhill skiing, as well as for relaxing walks in the forest. Plzen - the main city of West Bohemia is situated on the confluence of the rivers Mze, Radbuza, Uhlava and Uslava. It was founded in 1295. The town expanded greatly in the 19th century when most of its coal-mining and engineering works were established. Plzen is well-known mainly for its SKODA Engineering Works, for the Pilsner Urquell Brewery (Prazdroj) and Gambrinus Brewery. It is one of the country's busiest railway junctions, second only to Prague. The city centre has several valuable landmarks. The 14th-century St.Bartholomew Church, unusually located in the middle of the main square, has the highest church spire in the Czech Republic (103 m). The 16th-century Town Hall, beautiful palaces, old town houses and a Franciscan monastery are also worth visiting. 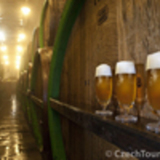 Other sights include the West Bohemian Museum, Museum of Beer-Brewing and J.K.Tyl Theatre. The typical restaurant located at the entrance to the Pilsner Urquell Brewery is most recommended. 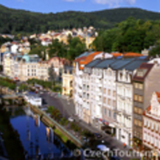 Karlovy Vary - Karlovy Vary is the biggest and best-known Czech spa. It was founded by King and Emperor Charles IV in the mid-14th century. The spa has some 60 springs, 12 of which are utilized for balneological purposes. Diseases of the liver, gall-bladder and stomach, as well as intestinal and metabolic disorders are treated here. This fashionable health resort is also attractive due to its historic architecture, beautiful colonnades and sanatoria. Most of its houses were built in the Empire style in the 19th century. The spa has hosted many famous visitors throughout the centuries, including Tsar Peter I, writers Kafka, Schiller and Goethe, as well as composers Bach, Beethoven, Chopin, Dvorak and others. The town saw the first European performance of Antonin Dvorak's Symphony from the New World in 1894. Famous visitors are commemorated by numerous statues and plaques. Traffic is excluded from the spa quarter. The town's theatre, galleries and casinos offer a busy cultural and social life, including music and film festivals. 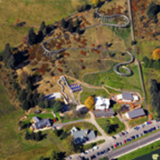 There is an 18-hole golf course, tennis courts and 120 km of hiking trails. Karlovy Vary is also well-known for its glass and china production. Moreover, for almost two centuries, the town has enjoyed fame as the producer of the Karlovarska Becherovka liqueur, the popular Mattoni mineral water and the original Karlovy Vary wafers. Marianske Lazne - Marianske Lazne is Czech Republic's second biggest spa town. It has 40 healing springs effective in the treatment of diseases of the kidneys and urinary tract, the respiratory tract, nervous disorders and diseases of the motor organs. It is a lovely resort located in a valley surrounded by forests. Marianske Lazne has numerous 19th-century buildings, large parks, well-marked paths to the nearby forests and lakes, and perhaps the best 18-hole golf course in the country. Hradec Kralove is one of the oldest towns in the Czech Republic. Established in 1225, it has become the economic and cultural centre of East Bohemia. In the 14th century, Hradec Kralove was part of Czech queens' dowry. A century later, the town supported the reformist Hussite movement and the Hussite leader Jan Zizka was buried in a local church. In the 17th and 18th centuries many important buildings were added, including the Bishop's Palace, the Jesuit College, a huge Baroque fortress, as well as numerous houses and churches. The early 20th century saw extensive building activity under the supervision of leading Czech architects Jan Kotera and Josef Gocar. The Old Town has the status of a protected urban reserve. Its centre is formed by a triangular square dominated by the Gothic Cathedral of the Holy Spirit, built in the early 14th century. The vicinity of Hradec Kralove offers many other interesting tourist destinations, such as historic towns, chateaux and fortified castles often bearing traces of the Austro-Prussian war of 1866, and the Cesky raj (Czech Paradise), the oldest protected nature reserve in the Czech Republic. 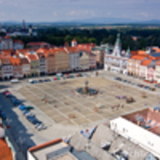 Pardubice is a town with a well-preserved historic centre, founded in 1340. It gave Prague its first Archbishop, Arnost of Pardubice. The originally Gothic town was considerably rebuilt in Renaissance style following devastating fires in the 16th century. It has a Renaissance chateau now serving as a museum and numerous valuable town houses. 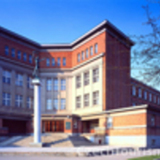 There is an Art Nouveau theatre and several outstanding modern buildings. 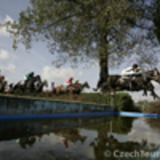 Ever since 1874, one of Europe's most challenging horse races, The Grand Pardubice Steeplechase, has taken place here every October. Pardubice is also well-known for its traditional gingerbread production. Krkonose Located 130 km northeast of Prague, the Krkonose Mountains form one of the most beautiful mountainous regions in the Czech Republic. The highest peak is Snezka (1,602 m, or 5,256 ft). In winter, the region becomes a paradise for both cross-country and downhill skiing. The highest peaks are covered by snow for as many as 180 days a year. In summer, the mountains offer an extensive network of well-marked trekking routes amongst the ridges, peaks, valleys and waterfalls, and providing panoramic views over green meadows and large woodland areas. The river Labe (Elbe) has its source here at an altitude of 1,386 m. Due to its extraordinary natural resources and numerous rare plants, most of the Krkonose territory received the status of a national park in 1963. In addition to its scenic beauty, the region also offers many fine examples of traditional folk architecture, including the oldest chalet Lucni bouda (Meadow Chalet), established in 1625 at an altitude of 1,400 m. The main resorts in the Krkonose Mountains are Spindleruv Mlyn and Harrachov. Spindleruv Mlyn is an internationally renowned mountain resort for both winter and summer sports. It is located on the slopes of the river Labe (Elbe), at an altitude of 718 m. The resort is surrounded by several peaks, including Medvedin (1,235 m) and the massif Plane (average altitude 1,100 m) with the St.Peter ski centre. St.Peter is the oldest part of Spindleruv Mlyn. Founded in the 14th century, it was an important silver and copper mining centre until the 18th century. Spindleruv Mlyn has preserved much of its old charm thanks to the many examples of traditional folk architecture. In addition, it offers numerous slopes, ski-lifts and a cableway for downhill skiing, as well as scenic tracks suitable for cross-country skiing and trekking. Nearby there are many destinations for walks and excursions, including waterfalls, valleys with rare flora, the glacial lake Kochelske rybnicky and a number of pretty mountain chalets. Harrachov is a mountain resort suitable for summer and winter recreation, located in the western part of the Krkonose Mountains. It has been popular with tourists ever since the mid-19th century. Harrachov has a cross-country track, ski-tows, chair-lifts and other facilities for cross-country and downhill skiing, as well as ski-jumping. It is a suitable starting point for walks and excursions to interesting destinations, including the Mumlavske Waterfalls on the river Mumlava, about 3 km from Harrachov, and the 130-metre long Pancavsky Waterfall, about 10 km from the town. Harrachov is also known for its traditional glass production, established in 1711. Pec pod Snezkou was established centuries ago as a copper mining town. The metallurgical tradition gave the place its name - "pec" means a furnace. Some of the mines and metallurgical workshops were still in operation at the turn of this century. Today, however, Pec pod Snezkou is just another popular resort for both summer and winter tourism and a good starting point for excursions to the eastern part of the Krkonose Mountains. 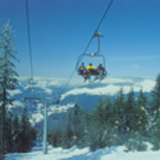 It has a variety of good slopes for downhill skiing as well as tracks for cross-country skiing. Usti nad Labem is one of the leading centres of the country's chemical industry, situated on the river Labe (Elbe) in North Bohemia. It is an important traffic junction. The town has five harbours on the Labe. The first manuscripts mentioning the town's existence date back to the mid-13th century. Usti nad Labem rapidly developed in the 19th century. Many historic landmarks were destroyed due to the expansion of industry and during heavy bombing in 1945. Despite that, there are several interesting sights including the 14th-century Gothic church whose 65-metre spire has been leaning ever since the 1945 bombing. The Baroque St.Adalbert Church (Sv.Vojtech) has been used as a concert hall and gallery. Outside the town centre there are the ruins of the Strekov Castle, built in the 14th century and deserted four centuries later. The castle was popular among 19th-century Romantic painters. L.A.Richter's canvas Storm at Strekov, displayed in the Dresden Gallery is one of the most outstanding Romantic paintings. The mystique of the place inspired Richard Wagner to compose his opera Tannhäuser. Litomerice is an interesting historical town located on the confluence of the rivers Ohre and Labe. It was founded in the 13th century and at that time it was considered one of Bohemia's leading towns and a rival to Prague. It has a Renaissance Town Hall, a City Museum and many valuable town houses lining the main square. The Baroque St.Stephen's Cathedral has a richly decorated interior, including a portrait of St.Anthony by Lucas Cranach. The town walls and high towers surrounding the historical centre rank among the most interesting examples of medieval fortification. Outside the town there are numerous orchards and vineyards. Each Septemper the nationwide exhibition of fruit, vegetables and flowers called Zahrada Cech (The Garden of Bohemia) takes place in Litomerice. Terezin is an old garrison town south of Litomerice. 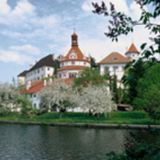 Its Small Fortress was built in the 1780s and named after Empress Maria Theresa. During World War II, the fortress was turned into a Nazi concentration camp in which some 80,000 Jews perished. The National Cemetery and Ghetto Museum commemorate their fate. Teplice - the town (about 110 km from Karlovy Vary) belongs to the eldest Europian spas, it is very nice town with many parks and fountains. About 8 km from Teplice is situated the town Duchcov with baroque castle. In this castle spent last 13 years world-known Giacomo Casanova. The visitors of the castle can see the works of prominent baroque painters and sculptors, historic furniture inside from Gothic to the half of the 19th century and also the flat of Casanova. The Czech Republic consists of three historic regions: Bohemia in the west, Moravia in the east, and Silesia in the north-east. The main industrial, cultural and historical centre of Moravia is BRNO, the second biggest city in the Czech Republic, with a population of 390,000. In the past, Brno was the capital of the former Moravian Margraviate. The dominant feature of the city is the 13-th century Gothic castle Spilberk, later rebuilt as a chateau. In the 18th century, Spilberk was fortified, and a century later, it was turned into a prison. 80,000 people were imprisoned here during the Nazi occupation. In the centre of the city there is a well preserved Gothic Town Hall with a watchtower, as well as numerous Renaissance and Baroque palaces and churches. In the Capuchin Monastery there is a crypt with the mummified remains of monks. The 14-th century Augustinian Monastery once hosted composer Leos Janacek, as well as J.G.Mendel, the first scientist to discover the laws of genetics. On Petrov Hill, overlooking the river, is the Cathedral of Sts.Peter and Paul, founded as a Romanesque basilica in the 11th century, and later rebuilt. The city also offers a number of theatres, galleries and museums. The Brno Exhibition Grounds are the venue for frequent international trade fairs. On the north-western outskirts of the city lies the Brno Dam Lake, the biggest recreational facility in the area. Jihlava is the centre of the Czech-Moravian Highlands. The royal mining town was established in the mid-13th century, near the local silver deposits. The heart of the town is a historic urban reserve. Its sloping main square is one of the largest in the Czech Republic. Other sights include the Gothic parish church founded around 1257, well-preserved fortifications and a Gothic gate, rebuilt in Renaissance style. The composer Gustav Mahler (1860-1911) spent his childhood in the town. Telc is one of the most beautiful historic towns in the Czech Republic, listed as a landmark protected by the UNESCO. The original 12-th century village was extended in the 13th century, and became a fortress surrounded by fishponds and water moats. It has had the status of a town since 1258. Despite later additions, the centre of the town has preserved its medieval character. The historic square is lined with Gothic, Renaissance and Baroque town houses with richly decorated gables and arcades. Other highlights include a 16-th century Renaissance chateau, a Gothic church and remains of the original fortifications. Near to Telc is situated small city Trebic. Trebic offers seldom preserved proof of centuries of co-existence between Christian and Jewish cultures in European towns. The town’s erstwhile Jewish quarter, Zamosti, with ore than 120 buildings, has been preserved by UNESCO almost completely. Mikulov is a town situated in picturesque surroundings on the slopes of the Pavlovske Hills, near the Czech-Austrian border. It is the centre of a wine-growing region, known mainly for its light white wines. The town was established below a Gothic castle in the 14th century. The castle was destroyed in 1945, and restored in the 1960s. 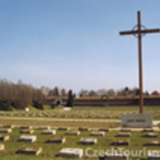 Other sights include the historic town reserve, Gothic and Baroque churches and the old Jewish cemetery. In the vicinity of the town there are many private wine cellars, some of them decorated in the traditional folklore style. Valtice lies between Breclav and Mikulov in the heart of Moravian prime wine region. The town and its chateau were on of the main residences of the Lichtenstein family, who owned it for five and half centuries. Valtice and Lednice are know in the Czech republic as Lednicko-Valticky areal and the area that encompasses both towns was declared a UNESCO World Cultural Heritage Site in 1997 as the most architecturally valuable region not only in Czech republic, but also in the whole world. Kromeriz. Towns ate every corner of the compass seems to be compared with Athens, Venice pr Paris, so it only seems right that this pretty corner of Moravia should have its own "Athens". Locally know as Hanacke Atheny (the Athens of Hana), this beautiful little town shot to notoriety as the seat of the potent bishops of Olomouc between 12th and 19th centuries. The town Kromeriz is dominated by the Early Baroque castle with a large park and unique Flower Garden. 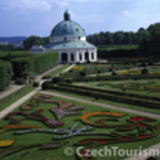 The strictly symmetrical garden is the best example of Baroque landscape gardening in Czech republic. Olomouc is the cultural and historical centre of North Moravia. It has a castle built in 1055. The local bishopric was established in 1063. In 1306, Olomouc was the scene of dramatic events when the last member of the Premyslid dynasty, Wenceslas III, was murdered here. Until 1641, Olomouc was the capital of Moravia. Later, Brno became more important. Olomouc University, now known as Palackeho University, was founded in 1566, moved to Brno in 1778, and restored here in 1946. The main sights include the Town Hall, founded in 1378, St.Wenceslas Cathedral, built in 1109 and later refurbished an 18th-century fortress, as well as many old town houses and churches of various styles. Olomouc has the status of a historic urban reserve. The town has three theatres and a symphony orchestra. It is an important railway junction, and an industrial centre, known also for its cheeses. The annual Flora Exhibition of plants takes place here. Ostrava is an industrial city in the Ostrava-Karvina coal basin located between North Moravia and Silesia, near the Polish border. It was founded in 1267, but it did not expand until 1782 when the local coal mining tradition began. Today, Ostrava is the country's leading centre of coal mining and metallurgy (Vitkovicke Ironworks). It is also the seat of the Mining University. The city has several examples of old architecture: The Old Town Hall established in 1687, now serving as a museum, a Gothic parish church, and an interesting small wooden church dating back to the late 16th century.